The attached jpg file is of an old family photo that was handed down to me by my father and it may be of interest to you. I was told that the photograph was taken in Twickenham just after the First World War. 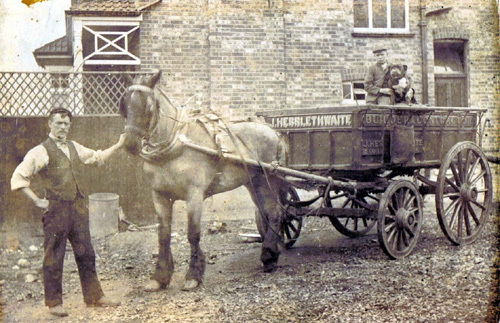 It shows my grandfather Charles John FENTIMAN holding onto a horse and cart belonging to his then employer - 'J. HEBBLETHWAITE Builder and Contractor'. I am afraid I do not know who the young lad in the cart holding the bulldog is but he may be a Hebblethwaite as I was told he was not a member of my family. The Census Return for 1901 lists a Julian Hebblethwaite, Builder, aged 40 living in Twickenham. The builder is Julian, Gould Rd., he married Isabella Churly, daughter of Octavius, in Islington in 1882. His daughter Alice Maud married Richard Harry Trelawney Hardy in Edmonton 1916. They had 2 children, Blanche born Weymouth 1918 and Julian (Albert?) born 1919 Edmonton. Richard was an Australian soldier who returned to Australia, where he died in 1936. I believe the family moved to Worthing, where Alice died in 1954. I am the great granddaughter of Julian and can tell you that the family moved to Rustington in Sussex where Julian built a house for my grandmother Alice Maud. This was the house I was born in. My father Julian Albert sadly died in 2002 in Spain where he had happily resided for nearly 30 years. My Aunt Blanche passed away a couple of years before him in Victoria, Australia. Finding this photograph and information about my relatives has been wonderful. I am in possession of the marriage certificate of Isabella as well and have been hoping to find more information on my family. I would love to make a family tree if possible to pass down to my son, daughter and grandson.